Hello, RazzieWatchers! Sorry this dispatch is late. It turns out they don’t have Wi-Fi in the Santa Monica-UCLA Medical Center, which is where I was taken by ambulance on February 25 to undergo open-heart surgery. They haven’t released me yet, but I got a friend to smuggle me my BlackBerry and I’m typing this RazzieWatch in the dead of night, under the covers. Luckily the ESPN.com copy editors will fix my typos! Needless to say, the day of the Razzie nominations is a blur to me now. Like all the other press, I crowded into Magicopolis in Santa Monica, tape recorder at the ready. I held up my microphone as John Wilson, Head RAZZberry, read the nominations. Almost immediately it became clear that this was going to be a record-setting day for Adam Sandler, as through just the first few categories announced he already had tied Eddie Murphy’s all-time nomination record of five. When Sandler surpassed Murphy, I admit, I screamed a little bit. Out loud. And then things got kind of rough. I laughed so hard at Wilson’s name for the most recent Twilight movie — “Breaking Wind, Part 1”!!! — that I started to hyperventilate. I tried to breathe into the paper bag I’d carried in from Subway, but it’s hard to do that and hold a microphone in the air and make notes in an official Reporter’s Notebook (just like David Carr uses!). Also, the bag smelled so strongly of vinegar that it wasn’t helping things. 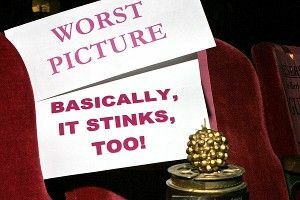 Then Wilson announced the Worst Picture nominees, which included both Bucky Larson: Born to Be a Star and Jack and Jill, and I realized that Adam Sandler had collected 11 nominations. He more than doubled Murphy’s previous record! I’m not embarrassed to tell you that I shrieked. I’ve listened to my tape a number of times here in my hospital room — despite the pleas of my roommate, Chris — and I’m not quite sure all what I said, but it included the words “Jesus” and “I’m so happy” and “This is the greatest day of my life” and some other things that maybe aren’t appropriate for me to type on a family website like ESPN.com, which is run by the Walt Disney Company. Anyway, I collapsed, apparently with a massive heart attack. Look, Razzie fans. In the end it doesn’t matter how many of our predictions we get right (although I think that in a year of shocking upsets like this one, if anyone beat my 33/50 I’ll eat my hat). It matters that the awards we love so much are as exciting as possible. And this year, with just one short month until the April Fools’ Day ceremony, the movie-going world is more excited about the Razzies than they’ve ever been. Heck, my ol’ ticker could hardly take it, and I bet I wasn’t the only one! Imagine how exciting the ceremony will be! I’ll be there, don’t worry — pacemaker and all. The last thing I said to my ESPN.com editor Mark was, “Wild werewolves couldn’t stop me from attending that Razzie ceremony, Mark!” He gave a shy little laugh (he’s shy) and said, “Well, we’ll talk about that when you’re feeling better,” which everyone knows is editor code for “YES”! Hold on, I gotta hit my morphine button. Ahhhhhh. Oh, and one last thing, Grierson Leitch, whoever you are: You don’t know what you’re talking about. The Oscars are the worst. Yeah, the Oscars happened this weekend, too, apparently. I was under sedation in the ICU, but I bet I wasn’t the only one unconscious during them, because they were, as always, a boring carbon copy of all that the Golden Raspberries represent. If I ever meet you in a screening room, Grierson Leitch, I swear to God I will shank you. I’m as serious as a heart attack. Like the one I had! Ha-ha! See you in April for the final RazzieWatch of the year! Dan Kois is a veteran Razzie guru who could use a ride home from the hospital tomorrow if anyone has a couple of hours free.